According to a 2018 Verizon Data Breach Report, 89% of retail data breaches were targeted at the point of sale system – making it a significant target for compromised data and a piece of technology unlike any other. 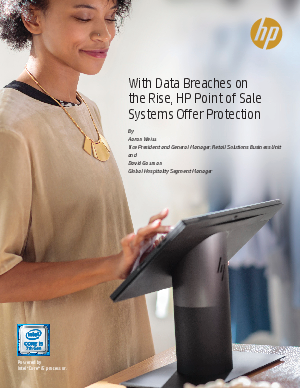 Learn from HP’s Aaron Weiss, VP of Retail Solutions, how the three levels of security focus are built into the HP Point-of-Sale portfolio of solutions to help provide critical protection to your device, your company’s data and your customers’ PII. Plus, with the latest 7th Gen Intel® Core™ i5 processor, HP devices are not only are secure but are specifically designed to power through peak usage adding a layer of durability that’s important to keeping your devices – and therefore your business – up and running.